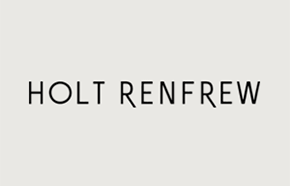 Holt Renfrew Boxing Day Sale 2015. December 26, 2015 get up to 70% off select women’s & men’s designer fall fashion. Special door crasher from 7AM-9AM (Montreal 9AM-11AM). 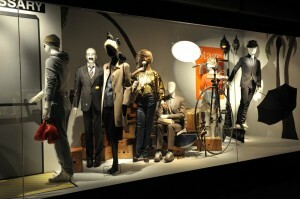 Extended store hours: Bloor & Holt Renfrew Men 7AM-8PM. Sherway 7AM-9PM. Vancouver & Yorkdale 7AM-10PM. Holts Renfrew's Boxing Day Sale Canada 2013 is the only Boxing Day Sale you will want! Get Morning Hour-Long Deals and Sales at Holt Renfrew on Boxing Day December 26th 2013. 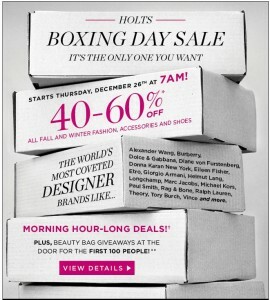 PLUS, Beauty Bag giveaways at the door for the first 100 people to arrive at Holt Renfew's Boxing Day Sale Canada 2013! Boxing Week is starting early at Holt Renfrew for Last Call. From December 20th to December 31st take an additional 80% off merchandise that has already been reduced up to 60%. You will not find prices better than these this holiday, so come in before stock is sold out!